The brilliant streaks of blue and green that color the Great Lakes in this image are a contradiction. 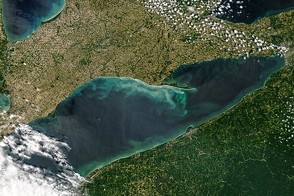 The blue in Lake Michigan and Lake Huron is sediment brought to the surface when strong winds churned the lakes. 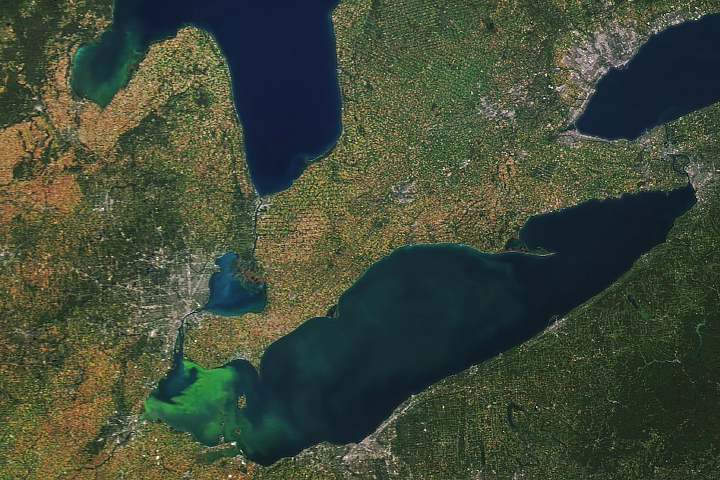 The green in Lake Erie and in Lake Huron’s Saginaw Bay is algae, which builds on the surface when winds are calm. Sediment most often colors the Great Lakes in the spring and fall when transitioning weather patterns bring storms and strong winds. The winds stir the water, pulling quartz sand and silt from the lake bottom to the surface, says Richard Stumpf, an oceanographer with the National Oceanic and Atmospheric Administration. The white sand looks milky blue when viewed through the water from space. It is a good tracer, says Stumpf, illustrating how circulation in the lake moves material from the banks to the center. The Moderate Resolution Imaging Spectroradiometer (MODIS) on the Aqua satellite took this image on October 9, 2011, a little more than a week after a persistent mid-latitude cyclone moved out of the region. 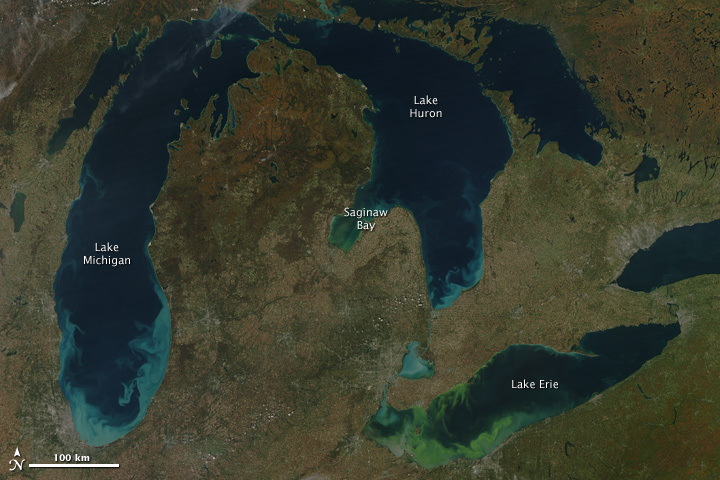 The storm brought strong winds to the Great Lakes region, and the resulting sediment first became visible on October 1 as the storm clouds started to move away. 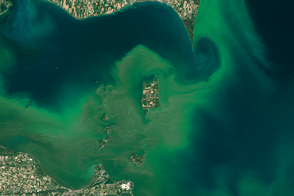 Some of the pale blue in Lake Erie may be sediment, but the green is an extremely large algal bloom. The algae may have initially spread across the western side of the lake because of windy weather, but calm weather and warm temperatures after the storm allowed green scum to build on the surface, says Colleen Mouw, a researcher at the University of Wisconsin-Madison. 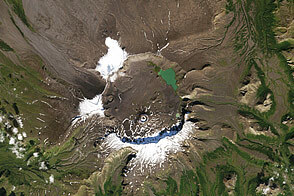 The bloom now covers much of the western half of the lake. “This is considered the worst bloom in decades,” says Stumpf. 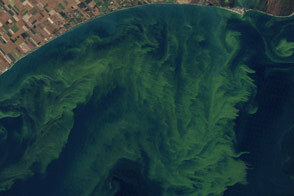 The green in Saginaw Bay is probably an algal bloom as well. The display of color isn’t limited to the lakes. Touched by autumn, the forests around the lakes have turned orange. 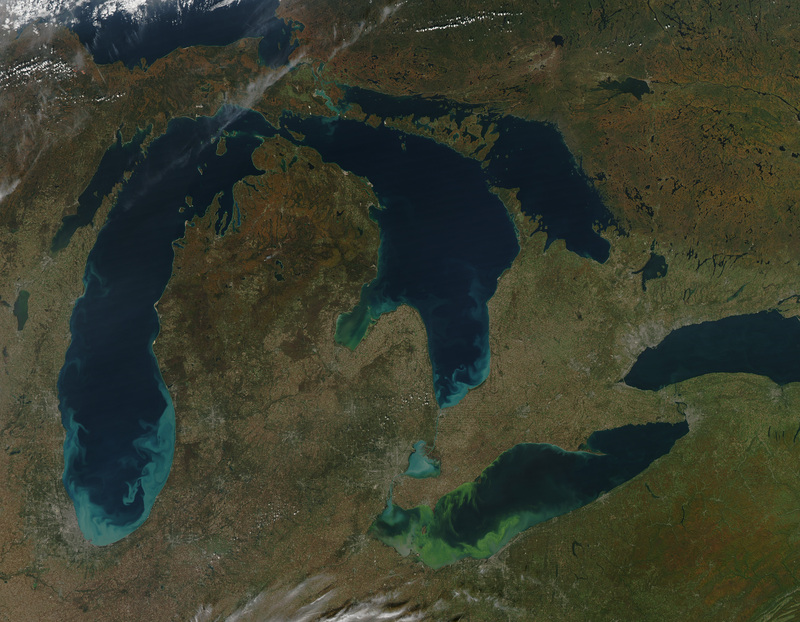 A massive algal bloom and storm-churned sediment color the Great Lakes in this image from October 9, 2011. Egan, D. (2011, October 6). Outdoors Insider: Report says Lake Erie algae worse now than in the 1960s. The Plain Dealer, Cleveland.com. Accessed October 12, 2011. Kuring, N. (2011, October 5). Lake Michigan turbidity. NASA OceanColor Web. Accessed October 12, 2011. National Oceanic and Atmospheric Administration. (2011, October 6). 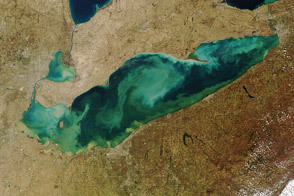 Experimental Lake Erie harmful algal bloom bulletin. Accessed October 12, 2011.